Sporting a 10inch screen and full-size keyboard, Palm’s new device called Foleo — which the company’s founder Jeff Hawkins talked up as a new product category in itself — is essentially a note-pad-sized laptop, designed specifically to dynamically sync with and compliment the computing power of a smart-phone. The problem that Palm is attempting to solve is that no matter how powerful cell phones have become, there are times when a larger screen and proper keyboard makes more sense — such as composing emails, editing a spreadsheet, or using web apps. 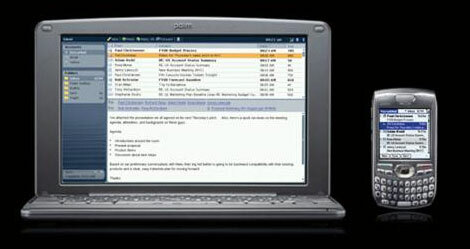 While the device can be used stand-alone — it has built-in WiFi and a suite of applications that run on a version of the Linux OS — the Foleo’s unique positioning is that upon connecting to your smart-phone (via Bluetooth), email is automatically synced, giving you full-screen access to your in-box, and any mail you send (or receive) is then accessible on both devices. The same applies for other data such as your contacts and schedule. Connectivity for the Foleo is provided either via your phone or with the built-in WiFi. USB port, video-out port, headphone jack, and slots for SD and compact flash cards for memory expansion. 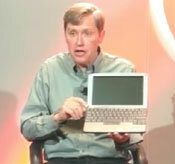 In a live webcast / conference call, Jeff Hawkins was asked if the Foleo was in fact positioned to be a laptop replacement. In testing users found that for many tasks the device does negate the need to carry around a conventional laptop, but Hawkins admitted that while the Foleo can accomplish lots of daily computing tasks, the processor isn’t powerful enough to playback online video for example. Initially the Foleo will work with all of Palm’s smart-phones, and most other Windows mobile devices. In the future the company hopes to be able to support phones based on Research in Motion’s OS, Symbian devices, and Apple’s iPhone. Additionally, the Foleo is an “open design” and Palm says it will be actively supporting third-party developers. Hmmm… as a geek I would like one as an ultra-portable laptop, apart from that use though it seems pretty stupid. You’re supposed to carry a smartphone with it that’s about 1/3 the size… oh but wait, if you need any processing power at all you also need to carry a full sized laptop. Most people buy smartphones to carry less devices, as all the functionality is crammed into one device. Now we’re at 3 devices and you have to carry a clunky smartphone. Next add the hands free bluetooth kit and you’re at 4 devices… oh god save us, it sounds like hell, and you haven’t even run into a syncing problem yet. 簡單來說，Foleo 是個長得像 notebook 的設備，要價 USD $500、跑的是 Linux、10 ….